The world is “way off course” in its plan to prevent catastrophic climate change, the United Nations warned Monday as nations gathered in Poland to chart a way for mankind to avert runaway global warming. After a string of damning scientific reports showing humanity must drastically slash its greenhouse gas emissions within the next decade, UN Secretary-General Antonio Guterres told delegates at the opening of a UN climate summit, “We are still not doing enough, nor moving fast enough”. Nor are any of the world’s largest emitters represented at the highest level in Poland. 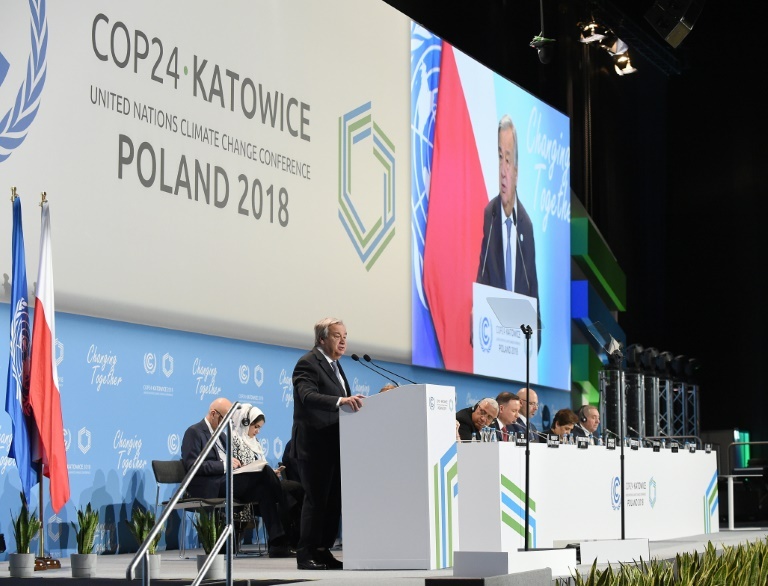 Officials from nearly 200 countries now have two weeks to finalize how those goals work in practice, even as science suggests the pace of climate change is rapidly outstripping mankind’s response. The World Bank on Monday announced $200 billion in climate action investment for 2021-25 — a major shot in the arm for green initiatives but one which needs bolstering by state funding. The background to Monday’s summit could hardly be bleaker: with just one degree Celsius of warming so far, Earth is bombarded with raging wildfires, widespread crop failures and super-storms exacerbated by rising sea levels. “Even as we witness devastating climate impacts causing havoc across the world, we are still not doing enough, nor moving fast enough, to prevent irreversible and catastrophic climate disruption,” Guterres said. Frank Bainimarama, prime minister of Fiji and president of last year’s COP, said developed nations must act now to save the planet. “Or, God forbid, (we) ignore the irrefutable evidence and become the generation that betrayed humanity,” he said.